With projected annual revenues of 1 million dollars, Friendliest Catch has recently launched its business harvesting stone crabs for local consumption and international export. This company was established in 2012 with the initial goal of acquiring stone crabs from local fishermen in North Abaco. To date over .5 million dollars has been invested into the company ranging from equipment to the harvesting and packaging plant located on the island. Abaco has a high number of second home owners, non Bahamian residents. In many cases, stone crabs have been on the same level of demand as lobster and crawfish. “Local tourists also complained about the scarcity of it, and this peaked our interest,” added Newbold. The company is Bahamian owned and involves a US partner, who has worked in diverse businesses including spices, Mergers and Acquisitions. Min. Renardo Curry, Parliamentary Secretary, Office of the Prime Minister, noted, “I am in full support of the project. One of the things that you will find is that in Abaco, most particularly North Abaco, these communities thrive off of fishing resources, and marine resources.” He added that as a result of this new venture, many job opportunities will be created. Speaking to the need for the government to assist entrepreneurs in marketing their products and services, Min. Curry added, “The Bahamas Government is in support of companies like this and I am working very closely with them to move the project forward. We as a government see the importance of partnering with local businesses to help them, and we will continue to do so. The first in an organized effort to harvest stone crab for export, Friendliest Catch also operates in environmentally sound conditions. Environmentally, certain restrictions have been imposed by the Dept. of Fisheries. 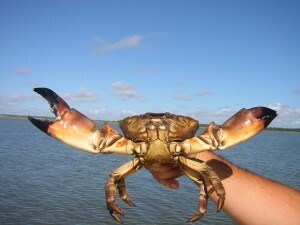 Stone crab is a regenerative product, unlike conch or fish, the claws are removed and the crab grows new claws. It is a product that regenerates. “Stone crab farming is a product that would also provide economic growth and satisfaction for generations to come. As a result, there is no risk of the product becoming extinct or endangered like some of the other seafood products,” added Newbold. He further explained, “We currently have several fishermen who are current suppliers. We have purchased traps, boats, engines and distributed them to those fishermen who have expertise in harvesting stone crabs. They have been able to benefit extensively from this injection. Last season one of the exclusive suppliers took home $40,000 for three months of work. The other suppliers were also able to pocket some money. The community needs the economic stimulation. Our hope is to get as many of these fishermen on board once they are willing to comply with our standards, the restrictions imposed by the Dept. of Fisheries, and they are willing to be upfront and honest with their business dealings with us. There is a great opportunity for as many fishermen that would like to sell to us. We are willing to meet, interview them, and bring them in to the company,” added Newbold. The stone crabs are processed, packaged and prepared for shipping. Within this production chain, local residents prepare the traps, ensuring that they are properly secured, local fishermen are hired, the stone crabs are graded, (logistics), “All of our employees are Bahamian and as the business grows we expect to bring more people into the fold, more suppliers, and employees,” said Newbold. Now that stone crabs are gaining more publicity, more attention, and there is a higher demand, we could possibly see this niche market developing strongly and becoming competitive with the lobsters and the fish. The official launch of the company will be held on Saturday, 6, July at the Treasure Sands Club, a high end restaurant, and resort, Treasure Cay Abaco. It will be held in conjunction with the All white party held monthly. At this event, the stone crabs will be featured. Antonio Huyler, Chef Extraordinaire will be preparing numerous stone crab dishes, there will be a stone crab display for regular attendees and VIP guests. The event will give persons an opportunity to mix and mingle with potential customers, local restaurant owners also to identify ourselves to the local fishermen who would like to come on board. The event will be coordinated by Tara Sawyer, STAR Events and Productions. Sawyer said, Guests can expect a spectacular, upscale event, with the main highlight of the evening being stone crabs prepared and presented in a variety of different ways. Hon. V. Alfred Gray, Min. of Fisheries and Agriculture has played an integral role in providing the owners with the proper direction in getting necessary approvals and licenses needed to conduct the business.